I know I can just reset the complete z-wave setup but the rest works nicely so I dont intend on doing that unless I have to, but that seems a bit rash to remove a single broken z-wave device.. It's still listed in your devices? What if you try it through Settings - Z-wave - Remove a device? Is it still in your device list? What happens when you click the cross on the top right of this device? Will appear if you hover over the card with your mouse. Is the option 'remove device' available in settings -> zwave ? Had the same problem as you have with my siren and Homey thought it was a second/slave controller of another Z-wave controller. 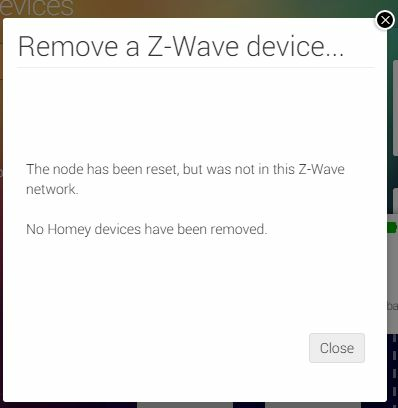 The option to remove z wave devices was gone and one button said something like 'remove homey from the z-wave network' instead of the regular buttons. I solved it by excluding all my devices, reset z wave. This will erase all insights logs and devices associated to the z-wave! and one button said something like 'remove homey from the z-wave network' instead of the regular buttons. >> that's what I said could be a last resort solution, but I was hoping Athom would maybe bring an alternative solution. Especially since I think this is something more people could run into in the future and you dont want to reset the whole thing every time. So 'remove a device' is completely missing in settings -> zwave? Just click the 'X' on the device and wait for about 30s. It will time-out, identify the device as a failed node and remove it automatically. Awesome, this worked! Thanks Emile! Is there an option you can clear a zwave device from its previous network? I did an factory reset... And now my zwave products can't connect. Because they're bounded to the previous settings of homey. So an option to clear a zwave product without first being assigned to the controller? Either reset the device itself, you will need the manual for the exact operation. Every z-wave device has its own way to reset it back to factory settings. If you want to know how, what device is it? Eminent EM6551 and EM6556, already contacted their customer service, they said it was only possible with help of an controller. hmm, it almost seems like they removed the menu's (default on the Z-Wave chip) in the socket, very unusual. oh well, i guess that's where the "remove device" in the settings menu is really added for. I've also an EM6556 builtin switch. But i cannot add it to Homey. Any clues? did you reset the device already? did you install the app? what version of homey and app are you on? what is the distance to homey? - I've placed the homey next to the eminent 6556 not working. - which app? i cannot see any eminent app on the store.